all three models are applicable to various fields of business. However, each of these options has its pros and cons and distinctive features. Outsourcing is more about a project-based business model. It is when a customer delegates the entire project from point A to Z to a third party. To implement the project the contractor offers all of the necessary resources, such as staff, equipment, and experience. 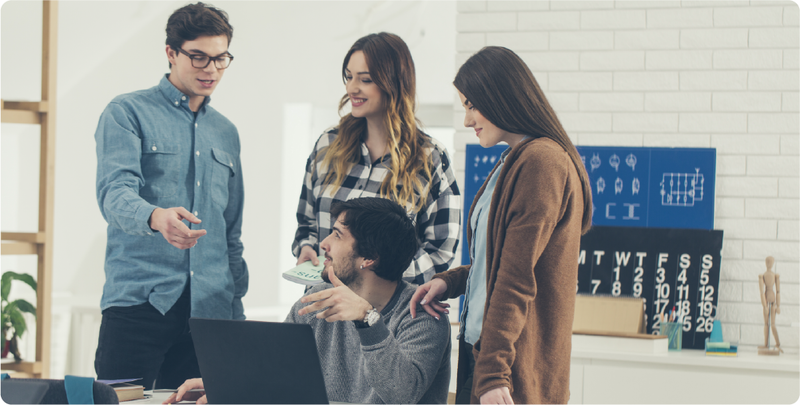 When it comes to contracting IT services out, the customer rarely has access to the development team, and the team itself may work on several projects simultaneously. For example, a FinTech startup needs financial software development having no in-house developers. The outsourcing company delivers the product on a turnkey basis. According to Statista, most common outsourced IT functions are software application development and maintenance (over 50%), data centers, IT infrastructure and help desk services. The global market size of outsourced services in 2018, according to the same statistics portal, is $85.6 billion. While a lot of people believe that outsourcing refers to cooperating with companies located abroad (usually in countries with lower salaries) that’s not necessarily the case. Outsourcing can be carried out by one company to another one, regardless of their location. What is outstaffing? It is mistakenly considered a part of outsourcing, but that’s a wrong idea. 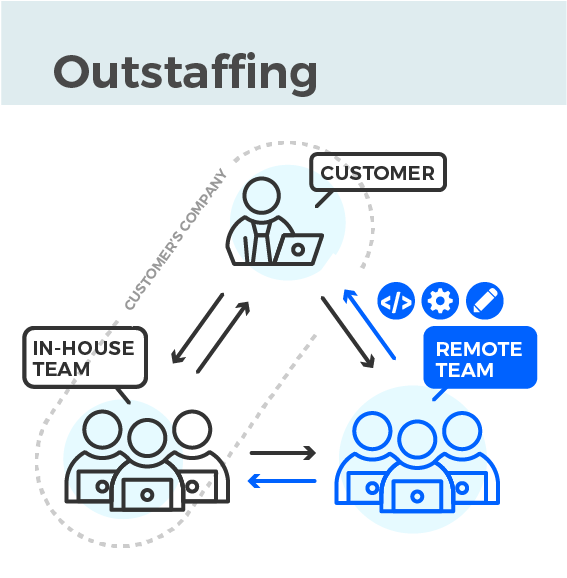 Outstaffing is hiring remote employees by signing a long-term contract to receive professional assistance in certain fields. The remote teams communicate with the in-house team and perform tasks you assign them. Officially the dedicated specialists are employed by a third-party company that is responsible for compensations, taxes, insurance, equipment, software licenses, office expenses and more. This way the customer pays for the working hours only. For example, a development company lacks test automation (QA) engineers for the project to speed up and facilitate the testing process. At the same time this company wants to reduce staff expenses and the amount of paperwork, therefore it hires a remote QA automation team. Hiring. It begins with figuring out the number of employees required for a project. It is followed by communicating with the outstaffing company and carrying out technical interviews. It ends up creating an offer. Onboarding. Establishing communication with the remote team, setting up the environment, tracking and monitoring tools. Workflow. It includes accomplishing assignments, careful progress tracking, and communication at each stage. Unlike outsourcing or offshoring, outstaffing is a relatively new phenomenon in the field of hiring. It became possible due to affordable technical opportunities, which help to organize remote teamwork. Shortcomings of the in-house hiring model in IT make large companies look for talent pools in other cities, countries, and continents. While outsourcing business process means contracting work out to third-party companies due to lack of specialists or experience in certain fields, offshoring is getting the work done abroad to drastically cut down expenses. Companies use offshoring to benefit from favorable tax and tariff conditions. As we have mentioned above, outsourcing is possible without offshoring. For example, a bank hires a software development company in the same country to create a mobile app. And offshoring is possible without outsourcing: an XYZ company decides to relocate its customer service center to a country with lower payrolls and hire locals to serve domestic customers. For example, a bank launches a first-line customer support office in India. Offshoring Vs. Outsourcing Vs. Outstaffing: which one to choose? Like any other business decision, the choice between outsourcing, offshoring, and outstaffing should be made when the business has carefully evaluated all of the pros and cons and has calculated the return on investment. Outsourcing is a perfect option or short-term projects in software development. It allows getting the job done, in case it’s a standalone custom software project. It’s a perfect option if your company is not mainly focused on technologies and you have no in-house project managers to control the work of a remote team. When it comes to long-term projects, you may want to consider outstaffing. It is recommended for technology-focused businesses with well-defined processes and experienced management. There is no need to worry about data leakage, just make sure you make up a short but comprehensive NDA agreement. 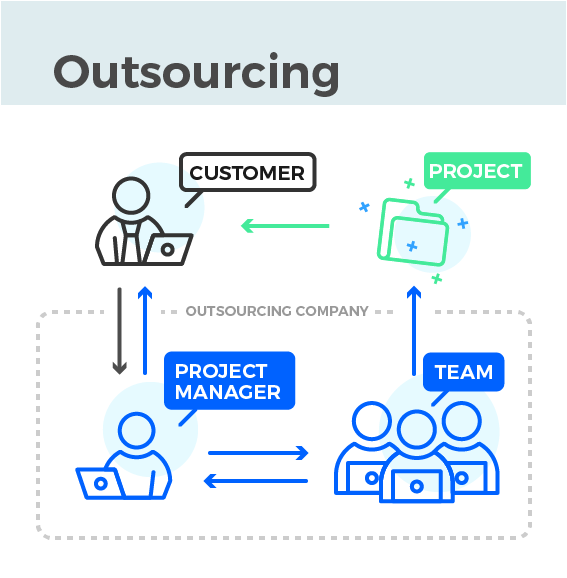 If you would like to build your own development team, open a separate office and have ambitious plans for future projects, then you may want to learn more about offshoring. All three options can work in combination. There is also an “offshore outsourcing” model – it means hiring contractors to perform the work offshore due to both lower costs and taking advantage of the contractor’s expertise, larger and easier scalable labor pool. In addition, there is a term “nearshoring” – transferring work to companies located in neighbor or just closer countries. As you realized the difference between these business models, it’s time to use their advantages to your business. There are software engineers, testers and more technical specialists in most countries including developing ones. Hiring in-house specialists in Silicon Valley is no longer the only way to get an IT project done. Businesses from the United States prefer looking for outsourcing companies in Mexico and Latin America due to the same working days and time zone. Also, they offer development services from the Philippines due to affordable rates of software developers and boosting the industry. In the last few years, more projects are delegated to software development companies from Eastern Europe. Customers from the US appreciate great skills of developers and low costs, while customers from the EU also find very convenient that the outsourcing company is located in an adjacent time zone. 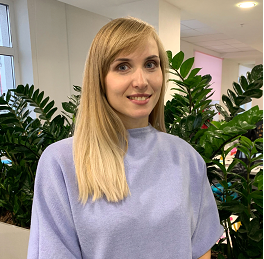 In recent years, software development in Belarus has become more popular. That’s quite explainable. The country has extraordinary expertise in technology development and is ranked #26 according to the Human Development Report 2016. The field of IT is represented by over 40 thousand professionals: developers, QA engineers, designers and more. Thousands of graduates join this team each year. In addition, Belarus Hi-Tech park is one of the leaders in innovative IT clusters in Europe. It offers favorable tax conditions for businesses and supports industry growth. In case you need an expert overview of software development outsourcing, you are welcome to contact Qulix Systems. We know a lot about these models as it’s our business. For more on outsourcing or outstaffing contact us at request@qulix.com or visit our website.